The Crazy blog of Crazydiamond: 3 more days! Only 3 more days until my half marathon! Here is a link for race info that I got from Sarah. I know some people might come watch me! Training is going well I think. I did a six miler today since I am tapering. I am a little worried because that short distance was a little hard for me today. I ended up taking Monday off because I was worried that I would get sick and now I wonder if I could have benefited from one more run. Too late, I guess! Today I finally got my car back after having a chintzy rental car for two days. My heated seats are now fixed! 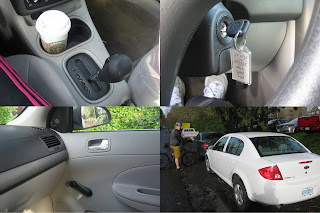 I made a little collage yesterday about the rental car. It had an automatic transmission and even had manual windows!